Cloud-based BI tools have become increasingly popular in recent years. Especially small and medium businesses have realized that outsourcing of BI infrastructure can provide resources previously available only to large enterprises. Cloud-based software is hosted on the vendor’s servers and accessed via Internet. Therefore neither system failure nor office dependency or extra IT infrastructure poses a problem, but there are still companies that remain mistrustful. They decide to employ on-premises BI software which is installed locally, on a company’s own computers and servers. Needless to say, each company is different and it lies in the hands of its employees to decide which solution is the most appropriate place for your specific data. 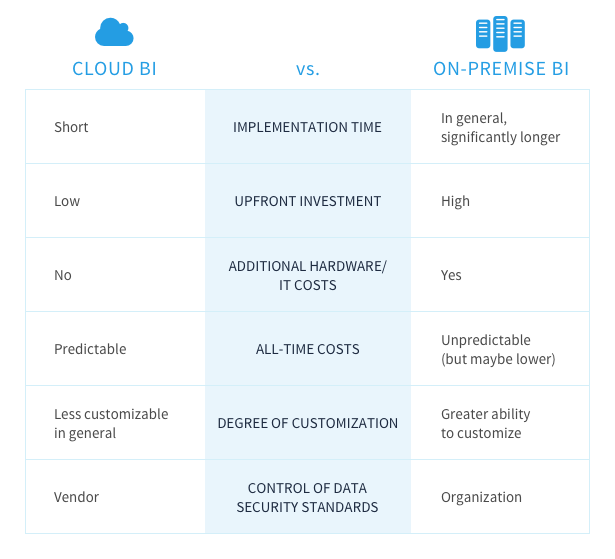 Generally, if all the pros and cons are put together, one can see that the benefits of cloud-based BI shadows the challenges thereof. At datapine we are supporters of cloud BI solutions and we find it most effective. However, we are also aware of the shortcomings of this solution that make some companies hesitate whether it’s better to put data in the cloud, or leave it in down-to-earth servers. As some of our clients have special needs and expectations, we have broadened our offer to include individual on-premises BI solutions. 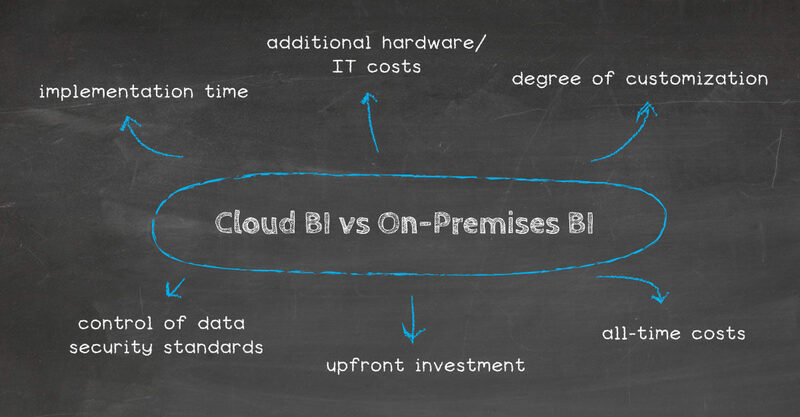 For this blog post we’ve summarized all the advantages and disadvantages of cloud vs on-premises BI – now it’s your turn to decide which option you choose for your business. Implementation of BI infrastructure in company premises used to take months, but now can be compressed to days or even hours. Self-service analytics tools offer automated and ready-to-use solutions for the everyday business user. Moreover, best SaaS providers including datapine, encourage potential users to try free trials and learn whether the concept would bring tangible benefits to their company without risk of failed investment. Obviously nobody wants to get oneself entangled in purchasing of a high-cost on-premises software that doesn’t end up actually getting used by the business. It might happen when your BI solution is based only on on-site servers and is so difficult to use that only trained employees can pull insights therefrom. It’s not the case with SaaS self-service solutions – they are easy-to-use for an average business user. Higher adoption rates of cloud BI results from lower learning curve, but also from better accessibility. When your data is in the cloud you can reach it from anytime and anywhere as long as you have a good Internet connection and login credentials. No access to the on-site server is needed. Moreover, it allows to share data faster. You can simply send a link through your e-mail rather than e-mail heavy files – this will surely increase your coworkers’ comfort of using data. The more intuitive and approachable the BI technology you choose is, the more likely your usage will soar, providing more opportunities to deliver insights to the business. When you decide to use SaaS BI tools, it’s like if you were choosing an all-inclusive service. Vendors take on the responsibility for the infrastructure and provisioning of the platform, updating and enhancing their tools regularly to provide the latest version of the software. On the company’s site, you can scale data resources up and down based on the size of your customer base, whereas IT teams can focus on their core tasks without getting bogged down when the number of customers abruptly increases. SaaS BI solutions require no hardware, software development, IT resources, machines, or servers – this entails lower costs for its users. Software from the cloud is priced on a monthly or annual subscription base which makes the cost predictable. If you want some added options you can pay extra. Another aspect that is worth taking into account is the spread of BI costs on the whole team. As mentioned before, most cloud BI tools are easy-to-use for anybody, not only trained employees, so the cost of use per capita would be significantly lower. Another great benefit of subscription-based cloud BI is the possibility to enter short-term contracts and use the BI solution, for example, only for a few months without the need to buy the full license. In general, the total cost of ownership favors the cloud. Obviously, if you go for a long-term subscription, the recurring fees will eventually surpass the cost of the one-time up-front investment in the on-premises software. However, don’t forget about the secondary costs that are involved in the on-premises option, like the investment in human capital, server maintenance and server replacement. New revelations about private data security breaches pop up in the media every week. No wonder companies are reluctant to entrust their data to the cloud. Sensitive data like accounting, trade secrets, business strategy, employee information or client lists, constitute long-term company’s assets, the loss off which would mean a serious crisis for the company. Although traditional on-premises solutions are also not devoid of shortcomings, trusting a third party with enterprise’s proprietary data means giving up too much control for many people. When data security is in the hands of the vendor in the cloud, he guarantees to follow strict data security standards, but it still doesn’t make all organizations have a total peace of mind with this arrangement. When data is spread over a large number of devices and resources being shared by unrelated users, the feeling that you don’t know where your data exactly sits may be a continuing worry. Moreover, if a cloud system is broken into the amount of information lost will be far greater than if it is on a single computer. As a German engineering company, we are subject to data security and privacy laws that are among the strictest in the world! Several cloud storage services allow for a limited bandwidth. If company’s size of data surpasses the allowance, the additional charges could be imposed. However, there are some providers that allow unlimited bandwidth within a subscription – this is a factor for companies to consider when choosing a cloud storage provider. Indeed there are still some places where there is no Internet connection and you have no access to your data. Still on-premises solution means even less mobility as the data is anchored to the server. Additionally, IT infrastructure can also prove to be faulty. Just imagine: coming into the office on a Monday morning and realizing you are not able to access your files because the server has gone down. Traditional servers can also be hacked into, hard drives can fail and computers can be stolen. So after all, it pays off to trust the cloud.